Believe me when I say that come this December, this superb release will be in contention, if not the odds on favorite, to win album-of-the-year honors. It is truly that strong. It clocks in at just over 52 minutes, with 14 outstanding tracks. The musicianship, as usual, is stellar, with Weekes’ backing band laying down some crucial, crucial rhythms. “Adowa” consists of Adoni Xavier on lead guitar, Radss Desiree on bass, Baldwin Brown on drums and Aya Kato on keyboards, with Taj Weekes on rhythm and acoustic guitar and vocals. (They are also joined by John Hewitt on keyboards and Valerie Kelley on vocals). There are also guest appearances by other talented musicians throughout. The recording was engineered and mixed on Long Island by Chris Laybourne, who also co-produced the disc with Weekes. The sound they get is full, crisp and clean, but they’d have nothing without the songwriting talents of Weekes. He is absolutely fantastic, one of the most intelligent and thoughtful lyricists on the planet. And man, he knows how to craft a song. Each one is so catchy, they could stand alone as singles. Seriously. From the first track’s opening salvo, “let your voice be as loud as your silence,” it’s obvious Weekes is not messing around. His vocals are top-notch and his lyrics are right on point. Heavy words from a heavy poet. The title track midway through is in an awesome nyabinghi style and the penultimate song is a beautiful stripped-down acoustic version of “Against The Machine,” found in full-band mode on the various artist compilation, “Occupy This Album.” Otherwise, it’s all in a strictly roots groove; there’s even a great take of the single “Here I Stand” (in fact, the cd has both versions of that tune, Weekes’ take on homophobia – “I will not judge”). I could go on and on how great each song is and how they flow perfectly into one another, but you simply need to hear for yourself. 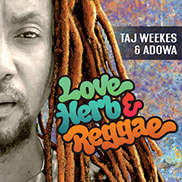 “Love, Herb & Reggae” is a classic disc - modern roots reggae with a message. It's the 4th exceptional studio album in a row by this fantastic band (along with a live disc) and in fact, may be the best one yet - and that's saying something. "Love, Herb & Reggae." Get it at all costs.